Abney Canine Training's (ABCANTRA) programs are designed to be a pleasant learning experience for both the dog and the owner/handler. You are guided each step of the way with instructions and demonstrations for each lesson. You will not leave a lesson without knowing how to perform the exercise properly and what steps should be taken if a problem is encountered. We encourage personal contact with us whenever you encounter a problem during training, and we make ourselves available to assist you if there is a need. Discussions and questions on previously taught lessons are routinely held prior to the start of the next new lesson to ensure that the owner/handler understands required exercises. Questions are answered to the best of our ability, and, if we do not have an answer to your question, we will do the research so as to provide you with one. 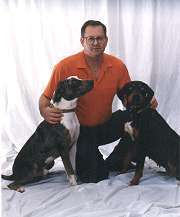 Don Abney has owned and handled dogs for most of his life. His early training was taught by his father, who presented him with his first dog when he was eight years old. That dog, Skippy, was a wild dog that had been captured during a rabbit hunting expedition. Don was aided in teaching this dog to sit, lie down, shake hands, beg, wait while food was being dispensed, and ride in a wagon or on a three wheeled bike with him. From there, dog training appeared nothing more than a game. Years later it was realized that there was a talent to handling dogs, and Don began instructing professionally. Don is in high demand for his talent as a speaker and instructor at seminars covering topics such as: Obedience Training, Tracker Training, Search and Rescue Dogs, Scent Work (all facets), and Behavior Problems. He has lectured on the subjects of Canine Training, Canine Tracking, the Louisiana Catahoula Leopard Dog, How to Greet a Strange dog, and the Hug-A-Tree and Survive program, and has provided numerous demonstrations. Master Trainer in Obedience, Tracking, Hunting, Search & Rescue, and Detector Dogs since 1980. Court Certified Expert in the field of Canine Training & Tracking through the Criminal District Courts of New Orleans, Louisiana, December 10, 1998, by Judge Julian Parker. UKC Conformation & Jr. Showmanship Judge. Co-author of bill signed into the Louisiana legislature presenting CGC as a dog defensive law. Licensed by the Drug Enforcement Agency as a Researcher in the Field of Canine Training - 1992. Trained and experienced in handling Dangerous, Vicious, and Nuisance Animals since 1994, with a commendation from St. Tammany Parish Sheriff's Office. Developer and Presenter of the Lost and Safe Program. 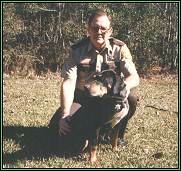 Founding member and trainer of Louisiana Search and Rescue Dogs, Inc. 1989 - 1996. Retired Lieutenant with St. Tammany Parish Sheriff's Office, Search and Rescue Division. Recipient of the Excellence in Training award presented by Sigma Chemical Corporation. Author of The Abney Method to Owning a Dog. A book on care and maintenance, behaviors, first aid, choosing and training a dog. Author of Canine Tracking Guide. A book on choosing and training a dog for human, animal, competition and blood tracking. Includes care and maintenance, and first aid. Author of The Complete Louisiana Catahoula Leopard Dog. A book on the updated history, breeding, and care of Louisiana Catahoulas. Past President of the American Catahoula Association.